Now Ash Gaming/Sunfox have released The Glass Slipper, a lovely looking slot which is of course based on the tale of Cinderella. ‘Cindy’ is how our heroine is referred to in this version and it tells the story of the Prince’s ball and her attempt to attend this swanky occasion. Cindy is a servant girl and cleaning is very much part of her life; if you can land a bucket scatter symbol on reel five you’ll win this bonus. Pick from a selection of 12 windows to clean and win a cash prize on each one until your first breakage. Land a dove scatter symbol on reel five and for that spin up to five wilds will fly onto the reels and help you win a decent amount of money. Now we’re getting to the good stuff and you’ll need to land the Fairy Godmother scatter on reels one, three and five to kick off this bonus game. You’ll receive 12 free spins but there’s a clock which ticks forward with every spin; your aim is to land three wins with this round’s special symbols (Cindy’s feet, dress and a pumpkin) and you’ll then head for the Grand Ball. You’ll enter this round via the Magic Free Spins and any time you have left on the clock will be transferred with you. You can now select dance moves to charm the Prince for cash prizes until the clock strikes midnight. The Fairy Godmother can randomly turn back time for you. 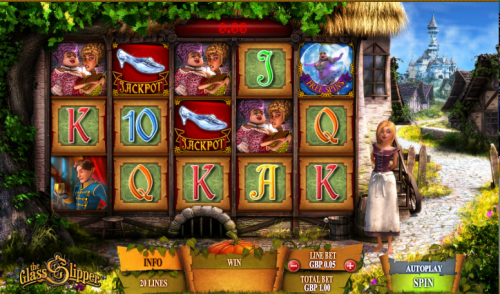 The Progressive Jackpot can be won by landing five glass slippers. The Glass Slipper looks good and has loads of great bonus features which should keep you coming back for more. There are five reels and twenty fixed paylines which means there’s a minimum bet of £0.20 and a maximum of £300.00.